Sinterklaas has arrived in The Netherlands again. Actually, he already arrived last week. Today his advance continued with a visit to my village. In the spirit of festivities I provide you with the Sinterklaas Layout. 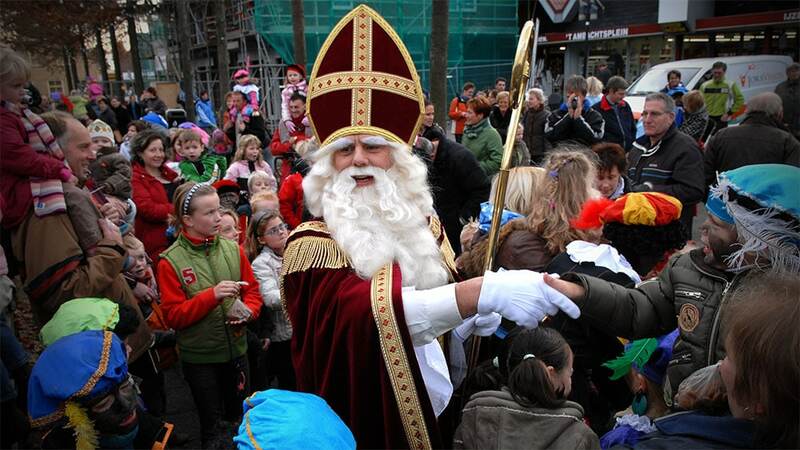 For small children in the Netherlands, Sinterklaasavond (St Nicholas evening) is much more important than Christmas. In recent years, some Dutch have started to celebrate Christmas Eve with Santa as well. On the evening of December 5, Sinterklaas brings presents to every child that has been good in the past year (in practice to all children). Sinterklaas wears a red bishop's dress including a red mitre, rides a white horse over the rooftops and is assisted by many mischievous helpers with soot black faces and colorful Moorish dresses, dating back two centuries. These helpers are called 'zwarte Pieten' (black Peters). Sinterklaas has a long white beard, holds a long gold colored staff with a fancy curled top in his hand and carries a big book with all the children's names in it, and whether they have been good or bad. Each year Sinterklaas arrives by steamboat 'from Spain', and is then paraded through the streets of the town he arrives in (actually in every town of the Netherlands), welcomed by cheering and singing children. His zwarte Pieten throw candy and small, round gingerbread like cookies (Pepernoten) into the crowd. The children welcome him by singing traditional Sinterklaas songs. Sinterklaas also visits schools, hospitals and shopping malls. His arrival is televised on public access television. Over years media attention has grown, while Sinterklaas is in the country the 'Sinterklaasjournaal' is aired every day, discussing his activities and any major 'problems' (which occur every year). Also, on the main day of celebration (traditionally December 5th) the Dutch version of Sesame Street the inhabitants of Sesame Street are visited by Sinterklaas as well. Traditionally, in the weeks before the 5th of December, before going to bed, children put their shoes next to chimney of the coal fired stove or fireplace, with a carrot or some hay in it 'for Sinterklaas' horse', and will find some candy in the form of a chocolate, marzipan frog in their shoes the next day, supposedly thrown down the chimney by a Zwarte Piet or Sinterklaas himself. However, with the advance of central heating children will put their shoes near the boiler or even just next to the front door…. Children are also told that in the worst case they would be put in the gunny bag that black Peter carries the presents in, and would be taken back to Madrid in Spain, where Sinterklaas spends the rest of the year. This practice however has been condemned by Sinterklaas, in his more recent television appearances, as something of the past. 'Sinterklaasavond' or 'Pakjesavond' is usually celebrated on December 5th, and by some on December 6th, children at home sing Sinterklaas songs and suddenly somebody will nock on the door very loudly, and when they go to the door a gunny sack full of presents is found on the doorstep. Alternatively – some improvisation is often called for – the parents 'hear a sound coming from the attic' and then the bag with presents is 'found' there. Some parents manage to 'convince' Sinterklaas to come to their home personally. Now you all know. I expect Sinterklaas layouts starting to appear on the internet in the next two days.